What you can and cannot recycle is sometimes far from black and white. Yes, we agree that if it was black and white it would make things easier, but in reality there are many grey areas. Let’s look at some common ones. If an item has a triangle recycling code on it, does that mean I can recycle it? No. The triangle recycling code was designed to help manufacturers identify what kind of plastic an item is made from. It does not indicate that something is recyclable. For example, polystyrene trays or cups may have a recycling code 7 on them, but they are not recyclable. Also, many items that have no recycling code on them, are recyclable.Whether at home or at work, always check your recycling guide to see what is and is not recyclable. Why isn’t recycling the same everywhere? Recycling programs can differ from Council to Council, and from building to building. Many factors can influence this. Recycling is a business, and the companies that sort, collect and sell recyclable material have different factors that influence their costs, markets, facilities and needs. 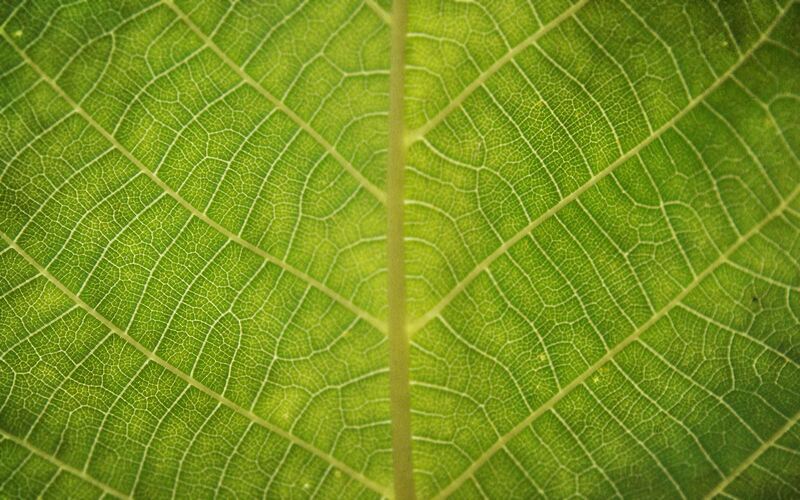 The recycling industry is constantly changing as new technology, innovation, and funding is made available. Do I need to rinse my containers before recycling? It Depends! Drink containers need to be completely empty, but not rinsed. For food containers, empty any food/residue. Depending on what was in the container, you might want to give it a good scrape, clean or rinse. For example a tuna can is often very smelly, so give it a little rinse with cold water (or use the water at the end of your dish washing). Can I recycle bottle tops and metal lids? Plastic – no. Metal – yes. Plastic lids/tops are too small for the recycling process, please remove them and place into landfill. Place metal lids into a can of the same type and squeeze the top closed before recycling. Is paper towel recyclable? No. In the past, some recycling facilities accepted this material for recycling. Now, in the majority of cases it is not accepted for paper recycling. Some reasons we have been given by the recycling companies are that the fibres are not suitable for recycling, or that the quality of the fibre is not high enough to warrant recycling. Can I recycle my disposable paper coffee cups? No. This is a complex, very grey area and we advise people to put them into landfill. There are so many different types of cups, and varying responses from recycling companies, but in the majority of cases, they are not recyclable. We advise people to avoid using them in the first place and use a reusable cup. See Spencer’s blog for a full run down. There are however, some definite black and white principles you can follow when it comes to waste and recycling that will help you. – Use less to produce less waste. Buying less and buying items that have less packaging means you reduce your waste. Recycling is the last resort. For example, buy your own re-usable water bottle and stop buying bottled water. Have your coffee in instead of taking out. One couple decided to go ‘waste free’ for a year – and they did it. It is amazing how much waste you can avoid producing if you put your mind to it. Check out their link here. 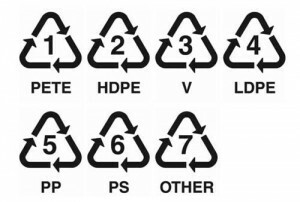 – Any hard plastic container, regardless of numbering can be recycled in a commingled (or fully commingled) recycling bin. Soft plastic, such as packaging and plastic bags cannot be recycled and should be put into your landfill bin. – If you are in doubt about whether you can recycle something, ask. Check out your Council’s recycling guide to recycling at home. Check the recycling guide for recycling at work. Ask until you find the answers. Take stuff home and recycle it. If you are out and about and there are no recycling facilities, take it home with you and recycle it there. I hope this has helped to clarify some grey areas – happy recycling and reducing! 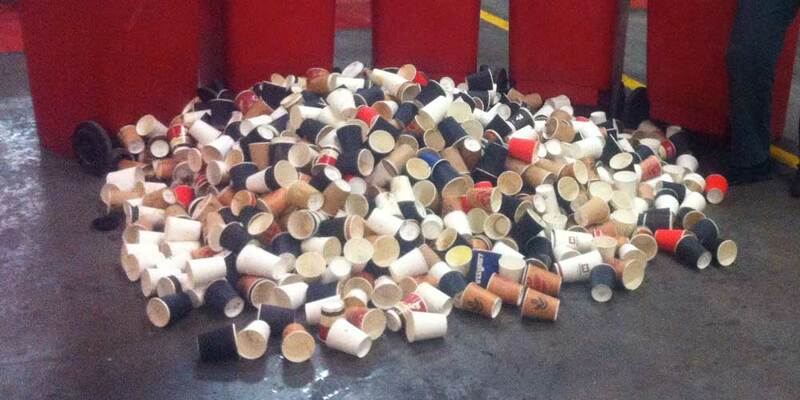 During our waste audits, disposable coffee cups are a consistent contributor to the landfill stream. They commonly amount to over 20% of landfill waste, a disturbing figure and one that can be significantly lowered with a little work. Because disposable coffee cups are a complicated mix of plastic and paper they are difficult to recycle and consequently sent to landfills (and contaminate recycling streams). Another element that we don’t often consider with disposable items is the resources that go into their production. When comparing disposable cups to reusable cups, we also have to consider the materials used, the energy that goes into manufacturing and into transporting cups to the store (and to landfill). 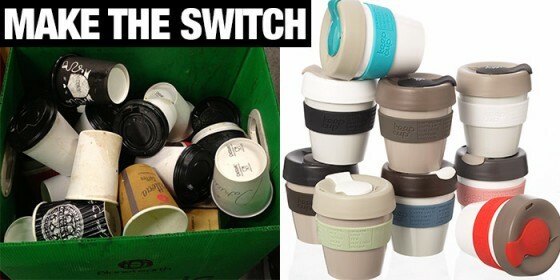 A reusable cup will have higher resource and energy use than a disposable cup, but after a number of uses (30 for KeepCups), they reach a break-even with disposables. After this point, every time you use your cup, you’re creating a benefit to the environment. One days worth of disposable cups found at a GFA waste audit. By using a reusable coffee cup, we are causing less disposable cups to be produced, lowering the amount of cups sent to landfill and saving the energy and resources that would otherwise be consumed. When talking to clients about disposable coffee cups, we strongly advocate that they switch to reusable coffee cups to reduce waste sent to landfill. However, we understand that a change like this can also mean a change to a routine or a ritual, such as a coffee run. I wanted to use this blog to talk about my switch to reusable coffee cups and how we ‘walk the talk’ at GFA. While most of us would prefer to sit down in a café and relax for a break, it is not always possible in the work environment. The take-away coffee is the convenient choice for on the way to work or for a quick coffee run during the day. Once I began regular work at GFA, I noticed myself using 1-2 disposable cups a day, as I was no longer having coffee at home or stopping for one before I went to class. I realised that this was a substantial amount of waste I was producing each day, but more importantly that this waste could be avoided. After looking at my habits, I made the choice to give reusables a go. I went out and bought a cup and incorporated it into my daily routine. If you’re going to make the switch, don’t do it out of guilt or any other pressure. Make the switch for yourself, to bring about a positive change to your lifestyle and the environment. It can take time to adjust, but it’s worth the time and effort once you’ve established a good system. As far as habits and rituals go, the coffee run can sometimes be a tricky one to alter. For many of us, it’s ingrained as a two or three a day habit and one that is interconnected with socialising, networking and meetings. It can also be highly stylized and an individualised habit, with everyone having his or her preferred coffee, café and disposable cup. The takeaway coffee cup serves as a brand or label and in many ways, receiving your takeaway coffee is an incidental status symbol, as it shapes the identity of the user and café. Any reusable coffee cup that is going to replace disposable cups must be convenient and have a style that you like. This means that you will need to like the look and feel of it, and it be easy to clean and trsnsport. You don’t want to spend too long washing up after finishing your coffee at the office, nor do you want a heavy, cumbersome cup to carry round wherever you go. In other words, you need to have an attachment to your reusable cups, just as you would a disposable one. In making the switch over, I had the advantage of working in an office where using a reusable coffee cup was the norm. This kind of office culture makes it very easy to change habits, especially social ones. Just as peers can reinforce the habit of using a disposable coffee cup, the opposite is equally true. Getting other co-workers on board will help you motivate each other and help the new routine to stick. 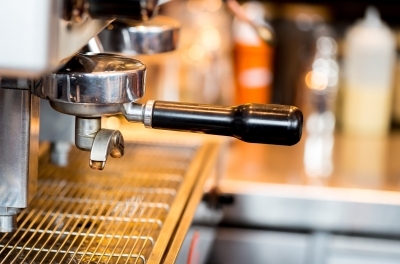 Thankfully, as reusable coffee cups have become more popular, we now have many options available that are ‘barista certified’ (compatible with espresso machines) and accepted by almost all cafes. Reusable coffee cups are generally plastic, glass or ceramic and the main difference between them is cost and design. 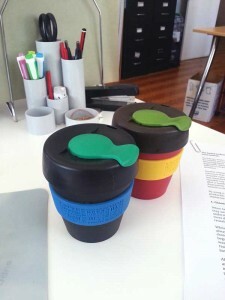 In our office, we use KeepCups, which are made from BPA-free plastic and offer lots of customisation in size and colour. Being made from high quality plastic means that they are a cheap option, while also being light, easy to clean and dishwasher safe. I have two KeepCups, one which stays at work and one that goes with me in my bag. This for me has been a really convenient system, as I don’t have to worry about taking my cup with me after work or vice versa. After establishing this routine, I have almost completely eliminated my usage of disposable cups. We also have spares at the office, which means we don’t even use disposables if getting coffee for someone else. While KeepCups are the most widely used, there are other great options out there. Ceramic cups are commonly available at gift or home ware stores, while I recently stumbled across the brand Joco, who make reusable coffee cups using glass, but in the similar style as a take-away cup (or KeepCup). They are a little more expensive, but a suitable and recyclable option if you are after the feel and safety of glass.